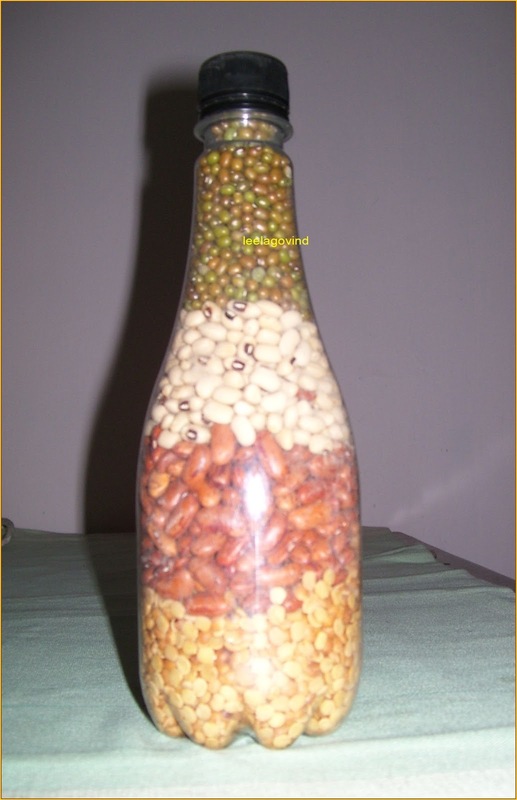 leelas hobbies: Dhanya Decorative bottle..
2)a beautifully shaped and styled glass bottle..
the lentils should be well dried in the sun ..the bottle should also be washed and dried well..1st choice of handful dals should be put inside the bottle and *slowly shake and tap the base of the bottle on the floor carpet 2 to 4 times to avoid gaps between lentils*....care should be taken not to break the bottle thats why i told you to tap on carpet..then the 2nd layer of your choice of some lentils put on the 1st layer and repeat the process *to*..repeat this process in every layer until it reaches the level of rim..if you have done the process perfectly you cant see even a small gap in between the lentils..finally close the bottle with a tight lid..i used only 4 layers here..you can use as many layers as you like..its upto you..
dhanyas in my bottle are not at all spoiled till date even though they had been filled abt 7years back..
here i used a plastic bottle,even then dals remained as such without any decay..yet, my suggestion is for a glass bottle which will be the best one..
m.. I too have one of this Leela. Think it is 9 years old. I must have put a few silica gel packets in it.